Oh thank you! I would never have guessed that's how it was done. Bleach can be scary for me-I usually get a splash of it on an innocent victim. I think even I could handle this one. The Girl Scout leader in me LOVES this!! I'm not much of a crafty person,especially since I have no little ones at home, but this looks like something the little Mr. and I could do for fun! 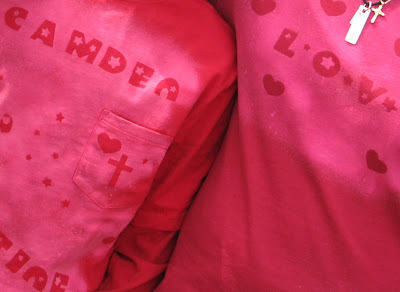 We wear matching shirts all the time, so could add a homemade one to the collection. Thanks sweetie! ps-I can not believe how much your son resembles you when you were a youngster. Cute kiddo! love it! the kids will too when we go on our first camping trip in May!! Yeah! !